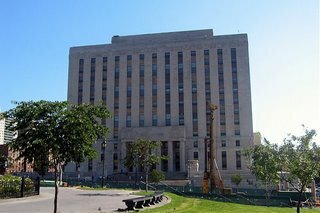 Tuesday, June 10th: Arrive Bronx County Supreme Court for 9:30 calendar call in “STP,” the Special Trial Part. Justice Howard Silver acts as traffic cop up on the 7th floor of the massive courthouse, sending some cases to pick, adjourning others and hopefully settling a few. On previous appearances here my case had been marked, after several adjournments, “final.” Then it was marked “final, final.” And finally it was marked “absolutely final,” as he made clear he would not accept additional applications for more time. One of my three adversaries strolls in at 11:00, and asks for another day or two, because he has a jury picked in Brooklyn. That case will either settle, he says, or he will find another attorney to try this one. Silver says no way, no how. Go pick. At 12:30 we are assigned to a judge (instead of being sent to the jury clerk), and told to report back at 2:00. The assigned judge takes a shot at settlement. The case details: July 2005 rear-end collision on a local highway. My client is a back-seat passenger in the lead car. She suffers a fractured hip, among other injuries, has a plate and screws put in, and stays in the hospital and rehab for 16 weeks. Her orthopedist says she has traumatic arthritis now and will need a hip replacement in the future. She is in her 60s and worked as a nurse’s aide. Summary judgment was granted 20 months ago against the driver and owner of the car that hit her from behind. Interest at 9% will run from that point. There is also an open issue, albeit a small one, as to whether the driver of her car shares in any liability. For reasons that escape me, the leasing company that owns the car that plowed into her from behind never called me and seriously tried to dispose of the case. This is odd since loss exposure can reach seven figures, with big interest piling up. They have litigated to the end of the line. As a result of the running interest, and a deterioration of my client’s condition over the two years, I have raised my demand. Four times. That’s what happens when you use real numbers for demands instead of pie-in-the-sky stupid numbers. Settlement talks don’t work. We are told to return Thursday to pick the jury and to be prepared to open Friday.